Sadly, Goodreads have seen fit to make it near on impossible for me and many other authors to offer giveaways on their website any more. They now charge anything from $200 to $600 to put a giveaway up, which is ridiculous. Authors alone are responsible for postage and supplying their books to winners. To add to the problem they now restrict the winners to residents in the US even though it’s the authors who are entirely responsible for supplying and sending out the books – what about the rest of your users Goodreads? You do of course, have your own agenda! I do however, still have two giveaways live on Goodreads. One for Louder than a Whisper and another for A Three Course Meal for the Mind, which I rarely hold giveaways for. If you have a Goodreads account and would like to enter either of these giveaways, click on the books to go to the relevant giveaway pages. The first one ends in 3 days and the other in 14 – if you don’t enter you can’t win and I won’t be posting any more giveaways on Goodreads itself, for obvious reasons. From now on my giveaways will be on other websites and I’ll post notifications of them on My Blog, and on my social media. Make sure you subscribe so that you don’t miss out. Please share this post on your social media so that readers and authors can know the situation on Goodreads. 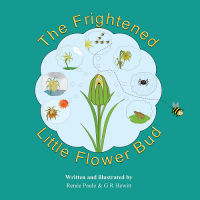 There's a Goodreads giveaway just started for The Frightened Little Flower Bud (Ends Oct 15th) This giveaway is not open to people in the US or Canada as it's a British spelling version. There will be another giveaway shortly for an American version The Fearful Little Flower Bud (begins 16th October - ends 15th November 2017. This giveaway will be open to everyone. Unfortunately, Goodreads will not allow the two giveaways to run concurrently. The story begins with a seed landing in a pretty garden where it begins to grow and eventually forms a little flower bud. But, the little flower bud becomes frightened of things she ‘hears on the wind’; such as the sun that might scorch her petals, the rain that might spoil them, the wind that might blow them away - so the flower doesn’t want to bloom. 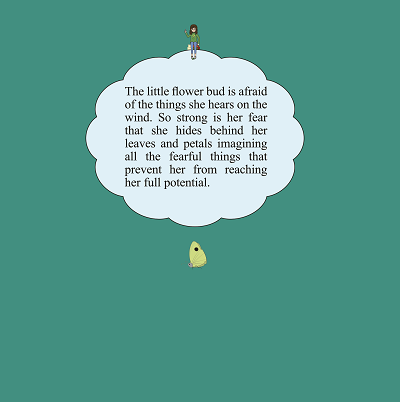 However, all flowers must bloom, and as the little flower bud opens her petals she overcomes her fears one by one. The more we think about our fears, the more they overwhelm us. This book teaches children (of all ages) that fear is just a feeling that holds them back from living their lives to the full. To add to the fun and develop observational skills there’s a ‘Did You See?’ activity page at the back with objects from the book that children may not have noticed whilst reading it. There are also some simple questions that can be asked of children, encouraging them to think about what they’ve read. The skill level required is ‘easy’. You have written five books - one for children - and have a sixth in the pipeline on the human condition. What drives you to write? What makes a flower grow, a heart beat or the sun shine? I don’t know the answers to these questions or to what drives me to write. I only know that I’m driven and that the ‘drive’ grows stronger with each book. Many people who read your books are looking for answers yet your books provide none; isn’t this rather a contradiction to being a self-help book? No it isn’t. If I provide answers to questions people have then some of them will listen to me and I may be wrong - it has never been my intention to become a ‘guru’. Self-help means just that; we need to help ourselves and not rely on others to find solutions for us - which leaves us none the wiser; our strength can only be found within. We must look for our own answers and I can only show you how I’m looking for mine. Having said that, I actually have no answers - just fewer and fewer questions and this has made my heart less heavy to lug around. What age group are your books aimed at, if any? When I wrote ‘On The Other Hand’ I thought my audience would be in my own age group (over 50s). I was surprised to discover that younger people like them very much too, so my answer is from around 15 or so upwards. Why did you start to illustrate your books after ‘On the other hand’ and how did the idea of ‘Dilly’ come about? I never thought about illustrating ‘On the Other Hand’. Quite frankly, I didn’t even know I had the ability to draw so it never occurred to me - I wasn’t artistic in my youth. When I was writing ‘Just Around the Bend’ an idea popped into my head of a ‘thought bubble thinking’ and I decided to draw it - it was just a bit of fun. From then on Dilly - a thought form that thinks - became a character in his own right and he was good at demonstrating points that I made in the text. I use ‘he’ when I talk about Dilly but I really don’t think of him as either masculine or feminine - it’s just for the sake of convenience. You do your own illustrations; how do you decide what aspect to illustrate? Your earlier books have fewer illustrations than ‘Stepping out of time’, which has 27; one short of the previous two books put together. Why is this? Sometimes the Dilly illustrations pop into my head before I’ve even written the point I want him to demonstrate, and sometimes the ‘point’ comes first; I have no hard or fast rules about this and let the illustrations develop as and when they want to. For this reason I can’t really answer the second part of this question. 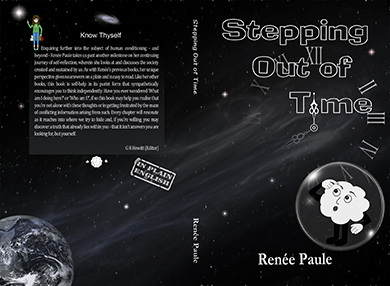 I can tell you however, that the images for ‘Stepping Out of Time’ came to me so quickly that I began to wonder whether my next book would be in comic strip format - as it turned out it was to be a children’s picture book. Why did you write a children’s book and do you have plans to write more of them? Again, an idea just came to me and I shared it with a friend and we decided to write and illustrate this book together. Yes, I have plans - and ideas - for more. Our children need to learn to think independently (outside the proverbial box) as much as we do. They learn from us and will become the future leaders of our world, so it’s important that we teach them not to be afraid of it. The latest book you are working on; is this in the same tone as your previous books; will it have more or less illustrations? I don’t believe that my tone changes, so my answer to the first part of this question is ‘Yes’. To date, I’ve not yet made any illustrations for it or designed the cover, so I can’t answer the second part of this question yet. Is there much more that you can write about on the human experience before you run out of ideas? I’m far from short of ideas. If anything, there’s a problem writing them down fast enough before I forget. Because the genres of my books are ‘self-reflection’ and ‘observation’ it follows that my ideas will only run out when I do! But, who is this ‘I’? If you had to sum up your books in a ‘Hollywood pitch’ for example, ‘Sci-fi Meets Supernatural’, how would you describe it? ‘Beds of Nails and Other Comfortable Places’. I can’t answer that question - I may not be around. Your books have no mantras to repeat, no exercises or meditations to perform and no means of tracking progress made; in fact, on the face of it there is nothing for the reader to do. How do your books work, how do they help people who read them to help themselves? Oh but they do have a mantra to repeat - ‘Who am I?’ Ask it and keep asking it. There are three ‘do’s in this question and this ‘doing’ has got us into enough trouble already. There really is nothing to ‘do', as such. We make life so complicated when it should be simple. 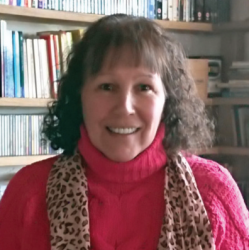 My books aim to help people to think differently and to let go of all that holds them back from being the best person they can be - from becoming a responsible and mindful person in society. I’m told that my books are both a mirror and a lens, and I believe that to be true. If my books teach anything at all then they teach us the truth about ourselves - steering us inwards - and this is all too often a difficult place to visit. 'The Frightened Little Flower Bud' is all packaged up and sent off to a few publishers now. If they don't like it I shall publish it myself, but I thought I'd give them a go first. 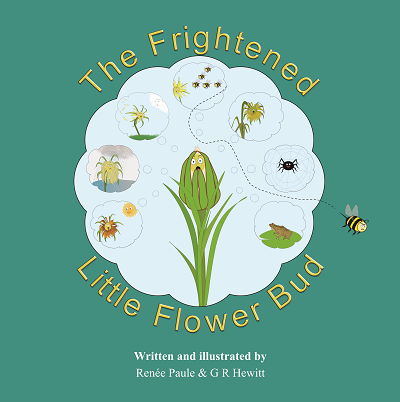 Co-written and illustrated with G R Hewitt, The Frightened Little Flower Bud. Is a lovely little 39 pager in full colour. Its messages are simple; don't believe everything you hear and don't allow fear to control your life. With these messages in mind the illustrations show the life cycle (thereby touching on the subjects of birth and death) of a Goat's-beard plant (Tragopogon - for the botanically minded) so there are some lovely nature lessons in it too. Suitable for all ages 4-99. To self-publish ... or not to self-publish - decisions ... decisions. I'm almost finished with this book. Co-written and illustrated with G R Hewitt, which has been fun. It's a lovely little 39 pager in full colour. Its messages are simple; don't believe everything you hear and don't allow fear to control your life. With these messages in mind the illustrations show the life cycle of a Goat's-beard plant (Tragopogon - for the botanically minded) so there are some lovely nature lessons in it too. Target audience - age 4-99. A little Feynman science and wisdom - in 5 minutes. For those who like to see how magical life really is. Click below for the video. Please watch and, if you like it, share this video. Life is simple. 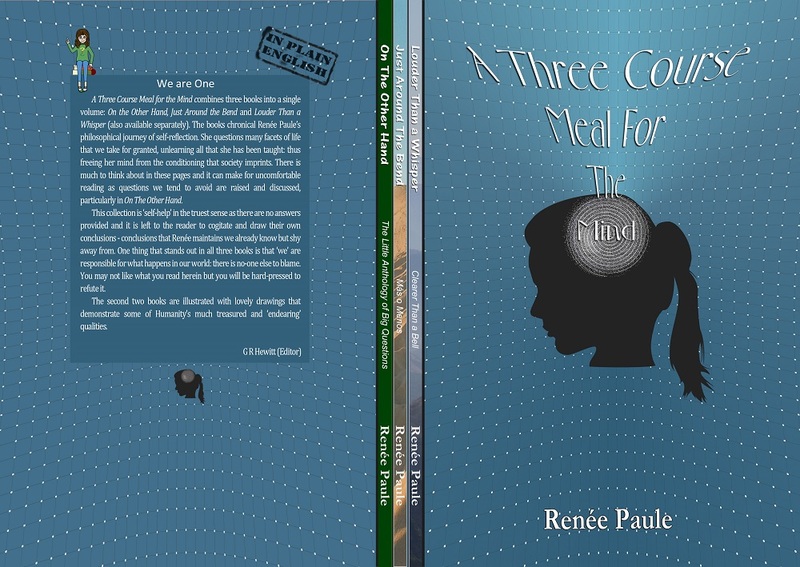 A Three Course Meal for the Mind combines On the Other Hand, Just Around the Bend and Louder Than a Whisper. I've put these three books together as one handy volume for those who wish to read all three. This has the advantage of being able to cross reference easily and of course it's far cheaper to produce - the cost to you being less than two separate books. Each book is still available to buy singly. 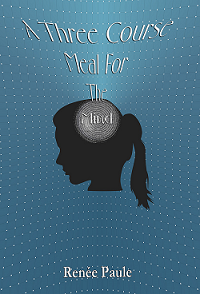 A Three Course Meal for the Mind will not be made available in ebook format; the original ebooks are available to buy at the usual outlets. Please note that my ebooks don’t contain illustrations. We need so little but, desire so much. Whilst walking past my local bakery I was stopped in my tracks by a tantalising smell. I was unable to make out if it was sweet or savoury but felt odd sensations that resembled ‘cravings’. Regardless, the event was full of flavours, urges, feelings of pleasure and the irresistible ‘come and get me’ invitation that at one time would’ve had me walking through the door in an instant carrying out further ‘investigation’. It was while I was lost in these pleasant evocations that it occurred to me what a wonderful and interesting thing had happened; it was all from sensual memory. How is it, I wondered, that I’ve vastly different aromatic experiences when passing a fishmonger’s shop; evoking less appealing memories? It was at that moment I decided to write about the abstract human trait that we call, desire. Sexual - to be desirable to or by another. Gastronomical - to desire food; for pleasure (excess?). Desire is not a word we use to describe the needs of people who are starving; food is essential. Financial - to bring us security; to eliminate personal lack of anything we want in this world for the duration of our lifetimes - but not beyond. Need is an entirely different thing; clothing, food and shelter. Religious - to bring us the greatest and most elusive prize of all; Heaven - if we manage to conquer our desires for anything other than God - but not until we die. Little wonder our focus is on the first three of these; they’re attainable within our lifetime. We’ve heard the word ‘desire’ or seen images being used in the above contexts more than any other - through subliminal messages and a great deal of early (often religious) conditioning. I told a few friends that I’m writing a chapter called ‘Desire’ (original chapter title) and asked what their initial reaction was to that word. To one it meant an expensive new car and to others it was an exciting new partner, improved personal appearance, happiness or an increase in wealth; things we’re conditioned to set our sights on. Interestingly, the desire for answers to fundamental questions about the ‘meaning of life’ were not mentioned. Are we so lost in ourselves that these questions have become undesirable? One person did say they desire ‘world peace’ but hadn’t thought about how it might be attained; ‘world peace’ has no more meaning to most people than any other throwaway cliché. In order to understand what desire is we first need to erase our conditioning through a process of enquiry - then look at it afresh. Without questioning the disorder in the world, we can’t expect to create order. Uh uh ... that's it for now :) However, I'll be announcing this book shortly and plan on putting it up for a pre-publication giveaway on Goodreads. 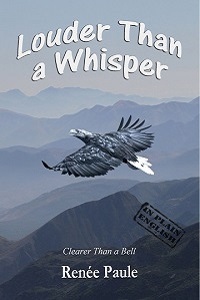 First, I must write the blurb; everything else is already prepared including a gorgeous book cover. As part of a process of 'consolidation' I've created a brand new website which has got rid of a lot of unnecessary buttons and repeating links. Tougher still was to further consolidate everything for a mobile friendly version of it. This was a tough exercise and I'm really happy with the results. 'Consolidation' is one of the chapters in my new book and it's a good exercise to help bring 'peace of mind'. This post was originally published on the 2nd March on Goodreads but for some reason not appeared here; I guess I must post them manually. I aimed to publish my new book by the end of May 2015 but that’s fast becoming an unrealistic date and it’s more likely to be out in the autumn. As I said in my previous post, this one’s a tough one and as usual, my mind keeps interrupting me with things that may well turn out to be far less important; I do, however, have to keep going with that heartfelt flow. One of those ‘things’ is an understanding of photography and in particular, shutter, aperture, white balance and ISO settings. Only the Universe knows why this has come into my field of vision and it’s helping me a great deal to understand what the human eye ‘sees’ or more accurately doesn’t see; the eye is the most powerful completely automatic ‘camera’ in existence. Don’t worry, I’m not going to get technical in this book (tech is not me) but it’s all helping to change my ‘point of view’ and to remove more of that wonderful ‘conditioning’ that we’ve all absorbed; in particular it challenges the old adage ‘seeing is believing’. I’ve also created several new Dilly illustrations and I’m working on more. Keep up-to-date with my progress on My website. I update a ‘flip_book’ on it all the time. I had many images and this idea came to me; I hope you enjoy it. A powerful but gentle wake up call to some of the problems in our world - in just '2 Minutes'. Years of collecting smiles has paid off and I've just uploaded this video to Youtube. I hope it brings a smile to your face.